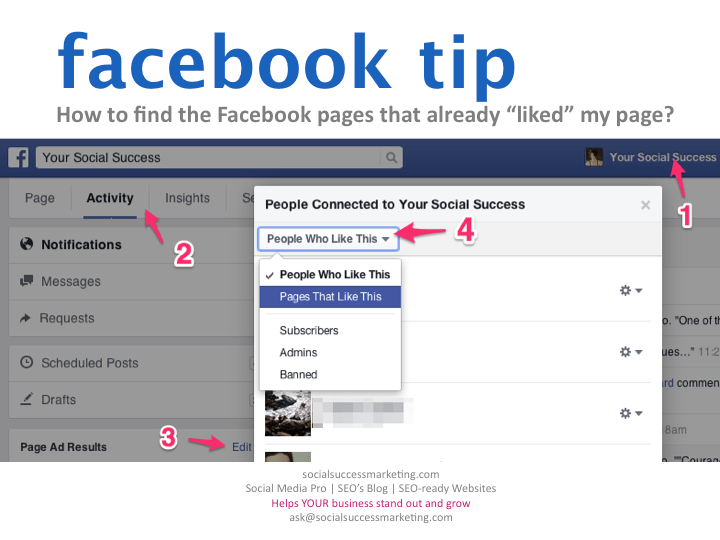 Home » Facebook for Business » Where is the Facebook page likes list? (UPDATED 11/11/2014) Facebook Page likes is one of those features that Facebook moved elsewhere when they implemented changes to Facebook Pages. When that happens its whereabouts is one of the most frequently asked questions I hear from friends in my Facebook community. Where is the list of pages that liked my Facebook page? (2) the list of pages that liked your page. All of these are still in the Admin panel and here is how to find it. To see the Facebook Page admin panel, click “Show.” Make sure you are IN the page you are managing. In the “New Likes” “Get More Likes” section, click “See All” “See Likes.” Click, “Activity” tab in the Admin Panel. A dialog box that says “People Connected to [Name of Your Facebook Page Here].” Click the drop down menu, to see the pages that liked your page. It’s all in there. [Note: Facebook no longer shows ALL people who liked your page]. Do you have a burning Facebook or Social Media question? Please feel free to contact ruby[at]socialsuccessmarketing[dot]com.